Wyc was raised in Tifton, Georgia where he graduated from Tift County High School, 1964, was an outstanding baseball and basketball player and delivered the high school valedictory address. Wyc went on to earn a B.S., with high honors, from Auburn University, graduating first in his business school class, Phi Kappa Phi and as Distinguished Military Graduate. In addition, Wyc earned a J.D. from the University Of Tennessee College Of Law where he graduated first in class, Order of the Coif and was a law review editor. Wyc had a long and distinguished legal career. Wyc practiced law for 43 years, including service as a captain in the United States Army Judge Advocate General’s Corps, West Germany, followed by 40 years of private practice, nineteen of which were with his daughter, Kristine Orr Brown. As a legal advocate, Wyc focused intensely on providing and ensuring representation for the poor, injured, those treated unjustly, and individuals less fortunate than himself, with an unwavering belief that one must “fight injustice wherever you find it.” Wyc’s work on behalf of indigent defense manifested itself most acutely in his spearheading the creation of the Georgia Public Defenders Standards Council for which Wyc served as a charter board member from 2003 to 2011. Wyc’s work on behalf of indigent defense culminated with his 2014 receipt of the Southern Center for Human Rights’ lifetime achievement award. 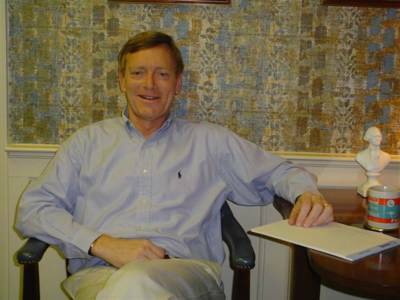 Among Wyc’s numerous legal accomplishments and accolades are his service on the State Bar of Georgia Board of Governors, founding and presiding over the Chattahoochee American Inn of Court (subsequently renamed the E. Wycliffe Orr, Sr. Inn of Court), and receipt of multiple awards for distinguished legal professionalism and ethics. 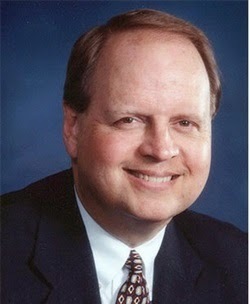 In addition to his legal career, Wyc served as a member of the Georgia House of Representatives from 1989 to 1993, was vice chair of Common Cause Georgia, served on the University Of Tennessee College Of Law Alumni Advisory Council, and was a past member of the Auburn Alumni Association Board of Directors. Wyc was a 40-year member of Gainesville First United Methodist Church where he previously chaired the administrative board and taught youth Sunday school. Wyc’s family is forever grateful for the exceptional medical care he received at Emory University Hospital under the care of Dr. David Kooby and the Rollins Pavilion staff. A celebration of Wyc’s life will be held Monday, June 2, 4:00 PM, at Gainesville First United Methodist Church. The family will receive friends at a reception following the service. A private burial will follow at Fletcher Cemetery, Alapaha, Georgia. Little & Davenport Funeral Home, 355 Dawsonville Highway, SW, Gainesville, Georgia 30501 is in charge of the arrangements. Lower the flag to half-mast - A Great American and a Great Georgian has left this life - Wyc Orr will indeed be missed. A couple of past posts about Wyc will follow. Wyc and I became friends when we were in summer camp together in the Army at Fort Bragg one long, hot summer in 1969, the summer the Eagle landed on the moon. And we continued our friendship afterwards. Wyc is as solid as the U.S. dollar and the Rock of Gibraltar. His word is his bond. His integrity beyond question and never in doubt. And he is smart, very smart. He was the first in his class at the University of Tennessee Law School, which puts him in the elite among the elite. From the Cracker Squire Archives: Let the battle begin: Even on Aug. 2 when Obama comes to Atlanta, Barnes will be in Middle and South Georgia (the Other Georgia). We love him here!! Jim Galloway of ajc's the Political Insider had a Saturday post entitled "Roy Barnes bets his campaign on rural Georgia." Based on the size and enthusiasm of the turnout in Enigma -- the home of Bobby Rowan, a former state senator and former member of the Public Service Commission -- at a 12-county rally yesterday, you would have thought the bet was won and it was time to call the dogs in, put out the fire and go home. What a great day in South Georgia! And Darryl Hicks, it was great getting to meet you in person. Good luck on your race for State Labor Commissioner. When our Yankee friends used to come into Atlanta they were welcomed (some might take issue with the word welcomed when speaking of Yankees) or at least greeted with the initials and call sign of WSB radio station on a towering radio mast atop the Biltmore, the call sign for WSB standing for "Welcome South, Brother." No towering signs were needed in Enigma for Roy on Saturday. There was an undeniable feeling shared by all of welcome to South Georgia Brother Roy, we love you and Godspeed. Last Tuesday night, for the third time, Roy Barnes won the Democratic nomination for governor. And then he dropped off the face of metro Atlanta. Not even an Aug. 2 visit to Atlanta by President Barack Obama will bring Barnes back. “He’s going to be in Middle and South Georgia,” campaign manager Chris Carpenter said Saturday. Barnes has bet his campaign on rural Georgia — the one that turned its back on him in 2002 for his removal of the Confederate battle emblem from its place on the state flag. “Roy Barnes told me about six months ago that if he wins this election he’ll have to win it south of Macon,” said Bobby Rowan, a former state senator and former member of the Public Service Commission. On Saturday, Rowan was one of the organizers of a 12-county rally featuring Barnes, held in the little town of Enigma, just east of Tifton. But Rowan, known for his poetic drawl and populist style, was exaggerating. The last time we saw a gubernatorial campaign like this was in 2002. A Democrat-turned-Republican state senator named Sonny Perdue picked out 70 counties in rural Georgia that, four years earlier, had voted for both Barnes and U.S. Sen. Paul Coverdell, a Republican. While the Roy Barnes of 2002 worked from Atlanta and hardly ever shed his business suit, each Friday night would see Perdue on the sidelines of several South Georgia high school football games, shaking hands and slapping backs. Those rural swing counties and a promise to put the 1956 state flag and its Confederate battle emblem up for a statewide vote formed the core of the effort that made Perdue the first Republican governor in 130 years. Carpenter, the Barnes campaign manager, acknowledged strategic similarities between the Perdue campaign of 2002 and the Barnes campaign of 2010. “We’ve taken our campaign all across the state. Roy’s been to over 90 counties,” he said. In last week’s balloting, Republican voters cast twice as many ballots as Democrats. But the Barnes campaign doesn’t believe the GOP grasp on rural Georgia is as strong as many think. Carpenter is a great believer in maps. One of those on the wall of the campaign manager’s Marietta office shows the Georgia counties with Democratic sheriffs — 108 of 159. The majority of these Democratic sheriffs work below the gnat line. While it has a Republican sheriff, Berrien County — home to Enigma — is one of those counties that voted for Barnes in 1998, then swung to Perdue in 2002. Rowan thinks his county is ready to swing again. Neither Nathan Deal nor Karen Handel, the two Republicans left in the race for governor, has paid Berrien County a visit. Eric Johnson of Savannah won the Republican side of the primary in Berrien, followed by John Oxendine. Rowan doesn’t think party labels will matter in November. Margins of that size, reached in multiple rural counties, could offset balloting from the Republican-dominated counties of metro Atlanta. A heavy turnout for Barnes in rural Georgia would essentially crack the super-majority of white voters required for statewide GOP victories. Rowan said the Confederate enthusiasts who dogged Barnes throughout the 2002 campaign are no longer a concern. “Sonny promised them a vote. They know they ain’t never getting a vote,” Rowan said. But it is the economy of South Georgia that has leveled the playing field, the former legislator said. “This whole election, it ain’t about a $3 tag, it ain’t about a chicken in every pot. It’s about a job for every man that’ll work. That’s the issue,” Rowan said. He told of an unemployed friend who’d recently confessed that, while his neighbors thought him prosperous, he was about to lose his house. “That man is not Republican or Democrat. He’s a human being,” Rowan said. “But if you make him a promise, and he believes you might can help him, that’s where his vote’s going. “He won’t even slow down to think about Republicans or Democrats. It’s too late for that,” Rowan said. From the Cracker Squire Archives: Wyc Orr, an impassioned Democrat and a great party spokesman, passes on the 2008 U.S. Senate race. I appreciated Wyc Orr calling me yesterday to let me know that he had decided against making a run for the U.S. Senate next year. His decision not to run is the subject of a post today in the AJC's Political Insider. Wyc Orr, who’s spent more than three decades practicing law in Gainesville and doing some politics on the side, . . . has become a popular figure in Democratic circles because of stirring speeches he’s made to groups of party activists in recent months. He shuns the defeatist attitude that comes from losing control of the governor’s office and the state legislature, and contends that Democrats should take credit for a lot of the progress Georgia has made in recent decades. Orr’s positive take on Democratic politics has energized young party activists who are pressing him to get into the 2008 Senate race against Republican incumbent Saxby Chambliss. A website has been created to draft Orr for a Senate campaign and petitions are being circulated across the state to drum up support. Wyc is passing on the upcoming Senate race, but I know he will remain the same impassioned Democrat and great party spokeman he has always been. Wyc, we appreciate you and what you have done and will continue to do for the Democratic Party of Georgia. Labor experts on both sides say the law doesn't take into account that health benefits have been negotiated by employers and unions over decades, and that rewriting plans to meet new requirements can affect wages and other labor terms. Another provision of the law that eliminates caps on annual and lifetime health-care costs has forced multi-employer plans to purchase their own insurance to prevent potential runaway costs from bankrupting plans. Jim Ray, a lawyer who represents the Laborers International Union of North America in benefits negotiations, said these provisions have increased construction-industry health plans' costs by 5% to 10%, and already resulted in lower wages for some laborers. He said employers are frequently seeking contract language to cap their own liability for future cost increases from the law. "When we first supported the calls for health-care reform, we thought it was going to bring costs down," he said. The union says it replaced the coverage with a combination of benefits, including health savings accounts. Elsewhere, the union has agreed to several supermarket contracts that eliminate health coverage for certain members' spouses who have coverage available elsewhere. "On a broad level, the biggest challenge facing all our negotiations is certain provisions the Affordable Care Act is demanding on plans," said Jill Cashen, a UFCW spokeswoman. In St. Louis, Barnes-Jewish Hospital has started charging co-payments to uninsured patients, no matter how poor they are. The Southern New Hampshire Medical Center in Nashua no longer provides free care for most uninsured patients who are above the federal poverty line — $11,670 for an individual. And in Burlington, Vt., Fletcher Allen Health Care has reduced financial aid for uninsured patients who earn between twice and four times the poverty level. By tightening requirements for charity care, hospital executives say, they hope to encourage eligible people to obtain low-cost insurance through the subsidized private plans now available under the law. In the past, Southern New Hampshire Medical Center generally provided free or discounted care for patients who were at or below 225 percent of the poverty level, or about $26,260 for an individual. But starting this year, only patients below the poverty level will receive such charity care, said Paul Trainor, the system’s vice president of finance. Patients “who refuse to purchase federally mandated health insurance when they are eligible to do so will not be awarded charitable care,” the hospital’s revised policy states. The financial challenges are particularly daunting in the more than 24 states that have not yet expanded Medicaid, including Missouri. The Affordable Care Act reduces federal aid for uncompensated care on the assumption that hospitals would replace much of the lost income with payments for patients newly covered by Medicaid. But the Supreme Court in 2012 gave states the right to opt out of the expansion. Now hospitals that treat the poor and uninsured in states like Missouri are losing federal aid without getting new Medicaid payments, a problem they say is threatening their bottom lines. Robert Hughes, the president and chief executive of the Missouri Foundation for Health, an independent philanthropic group, said BJC HealthCare was “in a tough spot” because of the state’s refusal to expand Medicaid. Life Lessons From Navy SEAL Training - Adm. William H. McRaven, commander of U.S. Special Operations Command, gave a commencement address last week that graduates, and their parents, won't soon forget. 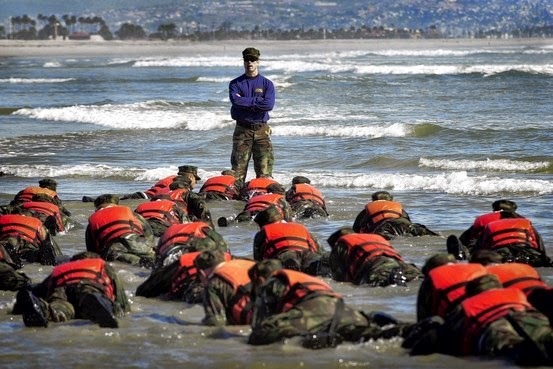 A Navy SEAL instructor and his class during 'Hell Week' in Coronado, Calif.
My wife Sally's father was stationed in Coronado while in the Navy. During our visits she always comments how amazing it is that so little has changed since she lived there years ago. Seeing SEALS training makes one want to come to attention and salute. God Bless America! The University of Texas slogan is "What starts here changes the world." "What starts here changes the world." That's a lot of folks. But if every one of you changed the lives of just 10 people, and each one of those folks changed the lives of another 10 people—just 10—then in five generations, 125 years, the class of 2014 will have changed the lives of 800 million people. If you think it's hard to change the lives of 10 people, change their lives forever, you're wrong. In Kandahar province, Afghanistan, a noncommissioned officer from the Female Engagement Team senses something isn't right and directs the infantry platoon away from a 500-pound IED, saving the lives of a dozen soldiers. But, if you think about it, not only were these soldiers saved by the decisions of one person, but their children yet unborn were also saved. And their children's children were saved. 1. Every morning in basic SEAL training, my instructors, who at the time were all Vietnam veterans, would show up in my barracks room and the first thing they would inspect was your bed. If you did it right, the corners would be square, the covers pulled tight, the pillow centered just under the headboard and the extra blanket folded neatly at the foot of the rack—that's Navy talk for bed. You can't change the world alone—you will need some help—and to truly get from your starting point to your destination takes friends, colleagues, the goodwill of strangers and a strong coxswain to guide them. But it seemed that no matter how much effort you put into starching your hat, or pressing your uniform or polishing your belt buckle, it just wasn't good enough. The instructors would find "something" wrong. For failing the uniform inspection, the student had to run, fully clothed, into the surfzone and then, wet from head to toe, roll around on the beach until every part of your body was covered with sand. The effect was known as a "sugar cookie." You stayed in that uniform the rest of the day—cold, wet and sandy. There were many students who just couldn't accept the fact that all their effort was in vain. That no matter how hard they tried to get the uniform right, it was unappreciated. Those students didn't make it through training. Those students didn't understand the purpose of the drill. You were never going to succeed. You were never going to have a perfect uniform. Sometimes, no matter how well you prepare or how well you perform, you still end up as a sugar cookie. It's just the way life is sometimes. Every event had standards, times that you had to meet. If you failed to meet those standards, your name was posted on a list and at the end of the day those on the list were invited to a "circus." A circus was two hours of additional calisthenics designed to wear you down, to break your spirit, to force you to quit. No one wanted a circus. A circus meant that for that day you didn't measure up. A circus meant more fatigue, and more fatigue meant that the following day would be more difficult—and more circuses were likely. To be successful in your mission, you have to swim under the ship and find the keel—the centerline and the deepest part of the ship. This is your objective. But the keel is also the darkest part of the ship, where you cannot see your hand in front of your face, where the noise from the ship's machinery is deafening and where it is easy to get disoriented and fail. As the sun began to set that Wednesday evening, my training class, having committed some "egregious infraction of the rules" was ordered into the mud. The mud consumed each man till there was nothing visible but our heads. The instructors told us we could leave the mud if only five men would quit—just five men and we could get out of the oppressive cold. All you have to do to quit is ring the bell. Ring the bell and you no longer have to wake up at 5 o'clock. Ring the bell and you no longer have to do the freezing cold swims. Ring the bell and you no longer have to do the runs, the obstacle course, the PT—and you no longer have to endure the hardships of training. Just ring the bell. Patton Boggs, the Washington legal powerhouse that helped pioneer modern-day lobbying, won't be Patton Boggs any more. Patton Boggs, the Washington legal powerhouse that helped pioneer modern-day lobbying, is merging with Squire Sanders, a large international law firm with roots in Cleveland, in a deal that marks the end of an era in the changing influence industry. The merger, approved by partners at both firms this week and announced Friday, concludes Patton Boggs’s 52-year run as an independent law and lobby firm. It comes after a year-and-a-half of uncertainty and financial troubles at the firm, which were heightened by its involvement in an unusual and expensive legal battle with Chevron. The new firm, which will combine Squire Sanders’s 1,300 lawyers with 330 from Patton Boggs, is expected to take effect by June 1 and will be called Squire Patton Boggs. The firms had been in merger talks since February. The deal represents a defining moment in Washington, where many credit Thomas Hale Boggs Jr., the firm’s chairman and scion of a Louisiana politics family, with creating the lobbying trade as it is now practiced. The end of Patton Boggs as a standalone firm is also a tale of an industry in transition. The firm could once secure its clients’ interests by relying on its ability to influence a few key powerbrokers, but it has been forced by changes in American politics to look for ways to sway larger groups of lawmakers and the public as a whole. Although Patton Boggs remains atop the list of Washington lobby shops by reported revenue, its advocacy business has struggled along with others in the face of a dysfunctional Congress that has been unable to make progress on most legislation. At the same time, many companies that used to be clients have increased their Washington lobbying staffs, while the ranks of the city’s trade associations, small specialty firms and other advocacy groups have also swelled, leaving less room for big firms such as Patton Boggs. Patton Boggs also has been hit by difficulties that have afflicted the legal industry. Law firms are facing mounting pressure to increase profits, while their clients trimmed their legal budgets after the recession in 2008. Those problems were made worse by several elements of the firm’s culture, including a compensation scheme that discouraged collaboration and made it difficult to attract new talent. In recent months, Patton Boggs’s erosion has been on full display. The firm had to lay off 40 lawyers and 70 staffers to deal with declining finances, high-profile partners defected to other firms, and at least one previous merger attempt was called off. The clash with Chevron, which involved allegations that Patton Boggs had committed fraud in connection with an environmental case in Ecuador, was resolved after the firm agreed this month to pay a $15 million settlement to the oil giant. Patton Boggs did not acknowledge wrongdoing. This step, though embarassing, was seen as necessary before the firm could go forward with a merger. Jim Maiwurm, chairman and global chief executive of Squire Sanders, said the merger would give the combined firm a leading position in the Middle East and several new locations in the United States. “Together we will be uniquely positioned to respond to the needs of business clients around the world,” he said. Patton Boggs is not the only law firm to struggle in recent years. Howrey dissolved in 2010, Dewey & LeBoeuf famously imploded in 2012, and almost every major U.S. law firm is facing pressure to maintain revenue and profitability. But Patton Boggs, and its marquee name in Washington, has drawn particular scrutiny. Boggs is the son of former Louisiana congressman and House majority leader Thomas Hale Boggs Sr. and Lindy Boggs, who succeeded her husband after he died. After working in the Johnson administration, Boggs went to law school and joined James Patton Jr. as the sixth lawyer of the firm that became Patton Boggs. At that time, in 1966, there were — by Boggs’s estimate — fewer than 100 people in Washington who called themselves lobbyists. In the early days, K Street firms were mostly small shops led by former heads of federal agencies. Boggs and Patton envisioned a different kind of lobbying operation, one that was integrated into a major law firm, staffed with attorneys well-versed in the areas of law that lobbyists were looking to change. The formula served them well. Boggs helped to orchestrate the first Chrysler bailout in 1979, a success that cemented Patton Boggs’s reputation as one of the most influential lobby shops in Washington. Patton Boggs enjoyed unprecedented success during the 1970s, ’80s and ’90s, when Washington’s lobbying industry was led by a cult of well-known personalities. Boggs — along with Gerald Cassidy of Cassidy & Associates, Stu Van Scoyoc of Van Scoyoc Associates, Bob Strauss of Akin Gump, J.D. Williams of Williams & Jensen and House of Hogan Lovells — put K Street on the map as the nation’s epicenter of advocacy. As of 2013, there were about 12,341 federally registered lobbyists, according to the Center for Responsive Politics. And that figure doesn’t include the thousands of people in public affairs firms, advertising agencies, and grass-roots and Internet campaigns that contribute to the influence machine. In the mid-1990s, Patton Boggs made a concerted effort to diversify, bulk up on staff and add new layers of management, going from a 150-lawyer firm to the 550-lawyer, 1,100-employee firm it was as of 2012. But the firm has been grappling with structural problems for years. It relied for too long on Boggs himself and didn’t have a succession plan implemented soon enough, according to some former Patton Boggs attorneys. The firm was also plagued by what’s known in the industry as an “eat what you kill” compensation system, under which lawyers’ pay is closely tied to the clients they bring into the firm. That approach reduced incentive to share work and contributed to a feeling among partners that those at the top of the firm were reaping most of the reward, leaving those lower in the ranks without their fare share. Moreover, Patton Boggs for years allowed many partners to stay even though they did not generate significant revenue for the firm, according to some current and former Patton Boggs lawyers. Patton Boggs remained strong until 2012, when it completed its representation of New York City against health-related claims over the Sept. 11, 2001, terrorist attacks — work that had been a major source of revenue for the firm. Overall, the firm’s annual revenue declined from $340 million in 2011 to $279 million last year. On the advocacy front, Patton Boggs remains relatively strong. In 2013, the firm took in $40 million in publicly reported lobbying fees — $6 million more than the next firm, Akin Gump. The firm’s involvement in the Chevron case dates to 2010, when Patton Boggs attorneys began representing a group of indigenous people from Ecuador who had sued Chevron over alleged health and environmental damage caused by toxins from oil drilling. The attorney representing the plaintiffs, New York lawyer Steven Donziger, won a $9.5 billion judgment from an Ecuadorian court, and Patton Boggs joined in the effort to help the plaintiffs collect the damages. The case quickly became problematic. Chevron went after Donziger, alleging that the verdict was the result of improper evidence, including a key expert report. In March, a federal judge in New York sided with Chevron, ruling that the verdict in Ecuador was the product of fraud and racketeering and that the judgment should not be enforced. But the judge did not rule on whether Patton Boggs had also engaged in wrongdoing. Shortly afterward, however, the judge allowed Chevron to pursue claims against Patton Boggs for allegedly committing fraud while trying to enforce the judgment. The matter was settled this month, when Patton Boggs agreed to pay Chevron $15 million in exchange for Chevron agreeing to release all claims against the law firm and its partners. WASHINGTON – Today, U.S. Sens. Saxby Chambliss, R-Ga., and Johnny Isakson, R-Ga., released the following statement after the Senate passed the Conference Report on H.R.3080, the Water Resources Reform and Development Act. The measure was approved by a vote of 91-7, and will now go to the president for his signature. The Savannah Harbor Expansion Project was authorized in the Water Resources and Development Act of 1999 to deepen the Savannah River from its current 42-foot depth to as much as 47 feet. The project is being undertaken in anticipation of an expansion of the Panama Canal that will increase the maximum draft of vessels travelling to and from the East Coast from 39.5 feet to as much as 50 feet. According to the Army Corps of Engineers, it will bring more than $115 million in annual economic benefit to the United States, primarily through reducing costs associated with transportation. Shifting Demographics Tilt Presidential Races in American Suburbs - Younger, More Affluent New Residents Are Reshaping the Vote in Metropolitan Regions of Denver, Atlanta, Washington, D.C. In the past decade metropolitan areas in states that are crucial to the electoral map have taken on more of the traits of their core cities—growing more urban, more diverse and better educated. LEESBURG, Va.—This was a pastoral, conservative Washington suburb until a decade ago, when new jobs sprouting in and around the U.S. capital began drawing younger, more affluent people like Bill and Heather King. Mr. King, a traffic engineer, and Dr. King, a hospital pediatrician, sought to live among other young professionals in a place with the vibrancy of their urban hometowns—qualities they say they found in this former colonial hamlet. Not long ago, the couple, both 33 years old, might have skipped over Leesburg, the seat of Loudoun County. But the self-described "Democratic-leaning" Kings are among a new crop of residents sinking roots in formerly reliable Republican Party strongholds, reshaping older suburbs in the metropolitan regions of Denver; Columbus, Ohio; Atlanta; Washington and elsewhere. These neighborhoods—so-called mature suburbs that sprouted in the decades after World War II—have become so densely populated over the past decade that they more closely resemble the big cities nearby. The U.S. census now classifies the counties that contain them as "urban." The population of mature suburbs in the U.S. grew to about 60 million in 2010 from about 51 million a decade earlier, according to a Wall Street Journal analysis of census data. The newer residents look, shop and vote more like urban dwellers than suburbanites of the past. They bring money and diversity to their neighborhoods, supported by jobs in government, academics and technology. Politically, Democrats see opportunity; Republicans see a challenge. Growth in mature suburbs has helped the Democrats in presidential contests. George W. Bush, the most recent GOP president, built his two election victories, in part, on broad suburban support. To win the White House in 2016, Republicans must retain their exurban and rural strongholds, while beating back the growing Democratic tide in the suburbs. From 2000 to 2012, the three mature-suburb counties around Atlanta all grew by double-digits, all saw their incomes rise and all cast a higher percentage of votes for Barack Obama in 2012 than for Al Gore in 2000. In Franklin County, a mature-suburb county that holds Columbus, Ohio, the population grew by 12% and median household income climbed by about $8,000 over the same period. Democratic voting also surged: Mr. Obama took 60% of the county vote in 2012, compared with 49% for Mr. Gore in 2000. The population of the two mature-suburb counties around Denver also grew over the same time, along with median household income. In the 2000 contest, Mr. Gore and Mr. Bush split the counties; in 2012, Mr. Obama won both. Vote totals from the 2012 presidential election show Mr. Obama won the most populous chunk of the suburbs, ceding only the more sparsely-populated exurban reaches to Republican candidate Mitt Romney. In 2000, the mature-suburb counties split 48% for Messrs. Gore and Bush. In 2012, 52% voted for Mr. Obama and 46% for Mr. Romney. A Journal analysis of voting patterns in metropolitan regions of Columbus, Denver and Atlanta—which include their mature suburbs—shows that voters went from favoring Mr. Bush or splitting the vote with Mr. Gore in 2000, to favoring Mr. Obama in 2012, by large margins in some cases. The surge in suburban population isn't all flight from adjacent cities, which was typical a generation ago. Instead, brains and money from across the U.S. are being lured to more concentrated geographic regions. Loudoun County is in northern Virginia, a battleground state. It is the wealthiest county in the U.S. and one of the fastest-growing. Between 2000 and 2013, the county's population doubled to 350,000. Its once sleepy county seat, Leesburg, is a boomtown, too: Its population was 42,936 in 2012, a surge of 62% since 2000. Minority residents account for 58% of Loudoun County's growth from 2000 to 2012, with Asians and Latinos making up the bulk of the increase, census data shows. Over the same period, the proportion of county residents born abroad grew from 11% to nearly a quarter. Change has come with the expansion of Dulles International Airport, a planned extension of the Washington subway, and, earlier, the arrival of nearby technology businesses such as AOL Inc., and Amazon.com Inc.
"A city is a fun place to be when you're young," said Mr. King, formerly of Baltimore, who moved to Leesburg last year with his wife and a baby. The couple is expecting again. Mr. King works for Loudoun County's transportation department, where he designs ways to manage traffic and accommodate the Washington subway, which is slated to open a stop here in 2018. His spouse, Dr. King, works at Frederick Memorial Hospital, about 25 minutes away. Together, they earn between $150,000 and $200,000 a year. "People tend to gravitate toward people with whom they feel comfortable," Mr. King said, with Loudoun County becoming "definitely more diverse." Mr. King voted for Mr. Obama in 2012, and Dr. King voted for Ron Paul. They consider themselves political independents. The Kings bought a house with a small yard in a neighborhood walking distance to shopping and a park, as well as biking distance to Mr. King's office. Their block reflects the town's changing landscape: A retired couple lives next door, and down the street is a young professional family from Philadelphia. Today, 23% of Loudoun County residents older than 25 hold a postgraduate degree, compared with about 11% nationally. The median age is 34.6 years old, compared with 37.2 years nationwide. The median household income is $122,000, nearly double the state median. Voters with similar demographic profiles have tended to vote Democratic in recent years, exit poll data shows. The changes have reworked the political and physical landscape of Leesburg—founded in 1758—turning the onetime rural exurb nearly as blue as Fairfax County next door. Retailers and restaurants reflect big-city consumer preferences. The colonial downtown is dotted with gourmet food shops, galleries and antique stores. The former Peoples National Bank is a wine bar and restaurant. The town boasts three Starbucks coffee shops, which scores 136 on the liberal index, with 100 the average, according to data from Experian Consumer Insights, a research firm that studies U.S. shopping behavior and assigns a score to retailers that measures how politically liberal its shoppers are. Down the road in the Dulles Town Center, there is a P.F. Chang's Bistro, 133; and nearby, a Chipotle, 160 on the liberal index. The "Village at Leesburg" blends housing and retail, anchored by a Wegman's gourmet grocery: 125. The chain stores in Leesburg are, with few exceptions, the furthest company outposts from the Washington metro center, essentially marking the capital's new lifestyle frontier, a line that moves farther west each passing year. The town council races are nonpartisan, but candidates' political leanings are generally known. In 1992, former CIA analyst Kristen Umstattd, a Democrat, was elected to the town council and Republican council members held a majority. She became mayor in 2002 and was re-elected in 2012. The population of Leesburg has tripled while Ms. Umstattd has been mayor, and Democrats now dominate the council. Thomas M. Davis III, a former Republican congressman from Fairfax County, a Virginia county closer to Washington where urbanization began in 1980, said GOP candidates must address the local concerns of newer residents if they hope to keep a foothold in changing U.S. suburbs. These voters "are not in love with Democrats," Mr. Davis said. "They're voting for their own interests, and who's going to treat them well." Republicans are losing the suburbs, Mr. Davis said, because fewer Republican moderates—many from centrist suburban neighborhoods—are running for office. Suburban newcomers, he said, "are economically more aligned with the Republican party, but they are just turned off by the social policy." Before retiring from politics in 2008, Mr. Davis won seven terms in Virginia's 11th Congressional District. He championed issues for Latino and Korean constituents, such as immigration reform and a South Korea free trade agreement. He delivered business and transportation development dollars. "There's not a Republican or Democratic way to fix a pothole," Mr. Davis said, paraphrasing Philadelphia Mayor Michael Nutter, a Democrat. The suburban shift is most pronounced in presidential elections. In House midterm elections, candidates can tailor their messages for local constituents—exactly what Mr. Davis is advocating. This year, changing suburbs won't help Democrats hold Senate seats in states where suburban voters are in short supply, including Louisiana, Arkansas and Montana. In the 1980s and 90s, developer Robert Buchanan helped transform Loudoun County from farmland to exurb. But after years of selling sprawl, Mr. Buchanan now preaches more dense, urban-style development. He said a local Republican official spelled out his misgivings: "'You are asking us to bring in more people who will vote us out of office.'" Those who moved to Loudoun County over the past decade triggered a substantial racial and ethnic shift. The non-Hispanic white population dropped from roughly 80% in 2000 to 61% in 2013. The Hispanic population has doubled, to close to 13%. The proportion of Asian residents has grown to 16%, from 5%. The changes present both parties with "a demographic imperative," said Rep. Gerry Connolly, the Democrat who won Mr. Davis's seat in 2008. His northern Virginia district, he said, "is now almost 50% minority. We're 1.1 million people and 27% foreign born. Which of the two parties will embrace that diversity?" The GOP, he said, "has almost doubled down in doing the opposite. The message is of exclusivity, judgment and disapproval of the fact that [minorities are] here, and their electoral returns in northern Virginia show them the peril of that." In the Virginia governor's race earlier this year, Democrat Terry McAuliffe won with a decisive advantage in these northern Virginia suburbs. He defeated Republican Ken Cuccinelli by about 2.5 percentage points statewide, but 22 points in Fairfax County and eight points in Prince William County. Leesburg went for Mr. McAuliffe 51% to Mr. Cuccinelli's 42%. Mr. Cuccinelli—who carried a well-known record as a social conservative—prevailed only in the more rural west. Voting data shows similar movement in key swing states across the U.S. where growing density and a shifting culture have changed the status quo, including Denver; Columbus, Ohio; and the Research Triangle in North Carolina near Raleigh. In Denver's metropolitan region, Mr. Obama's 2012 vote count was eight percentage points better than Mr. Gore's in 2000: 55% to 47%. He did better than Mr. Gore in metropolitan Columbus, 52.5% to 43.6%. Mr. Obama received 56.6% of the vote compared with 49.2% for Mr. Gore. Most of those gains came from votes in urbanizing suburbs, according to a Journal analysis of the totals. The blue tide of Loudoun County now nudges Purcellville—population 8,300—a GOP-led town west of Leesburg. Here, marketers cater to a more conservative clientele, while preparing for more liberal newcomers. Purcellville's "Gateway Center," built on a former farm, is anchored by a Harris Teeter grocery store—a "conservative" establishment, according to Experian—with a Starbucks. The former post office is a health-food store; the Tastee-Freez is a Mediterranean restaurant. More than 40 wineries and two microbreweries have opened. Purcellville Mayor Robert Lazaro, Jr., a lifelong Republican, backs his town's development, voicing more concern over building the commercial tax base than GOP voting rolls. He supports more dense housing downtown. Mr. Lazaro is from Long Island, which saw the same demographic and political changes during the 1970s and 80s that Loudoun County is now experiencing. The mayor doesn't care if the city-dwellers discovering Purcellville are Democrats or Republicans, he said, "as long as they bring their money."